Images from the football friendly matches played on Tuesday night. 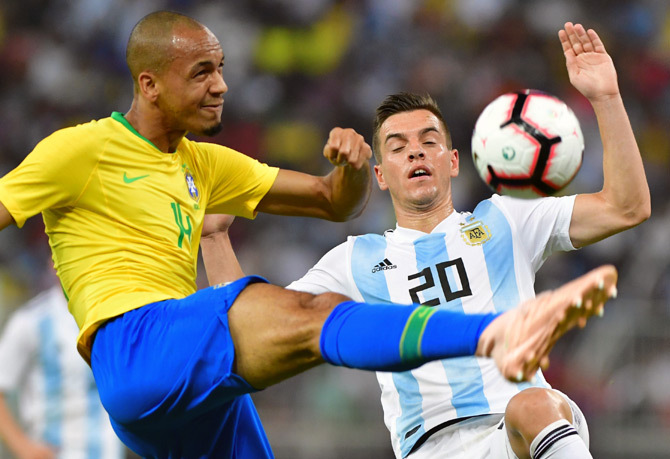 A stoppage-time goal from Miranda gave Brazil a 1-0 win over South American rivals Argentina in a foul-strewn friendly in Saudi Arabia on Tuesday. "Scoring a goal against Argentina is always gratifying and always exciting," Miranda said. 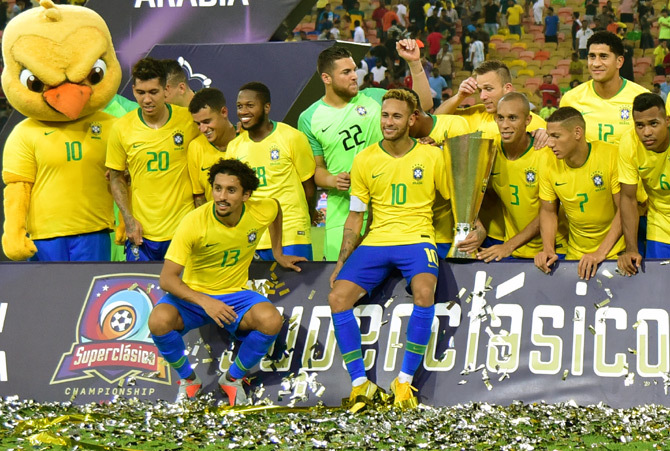 "The team felt tired in the second half but I think we dominated our opponents, we played well and we got the goal at the end," said Brazil's Filipe Luis. "Obviously our team is better than theirs, we have maintained the same squad for years and they are in the process of renewal, but you don't notice that so much in a clasico, what you do notice is their fight," the Atletico Madrid defender added. "But I think we deserved to win." It extends Brazil's run to four wins in four games since they were knocked out the World Cup in the quarter-finals by Belgium. Netherlands' Nigerian-born forward Arnaut Groeneveld scored his first international goal to secure a 1-1 draw at neighbours Belgium in a friendly at the King Baudouin Stadium on Tuesday. Dries Mertens volleyed an excellent opener for Belgium after five minutes, but the young Dutch side grew into the game and were level before the break thanks to Groeneveld. It was the first draw in 13 matches for Belgium, who had won 11 of their previous 12 games, the only blemish being the World Cup semi-final loss to eventual champions France in July. It was also a second positive result in four days for the rejuvenated Netherlands, who beat Germany 3-0 in the Nations League on Saturday and showed more signs of progression under coach Ronald Koeman as they came close to another victory. Belgium took the early lead when Eden Hazard's mazy run into the penalty area saw the ball eventually fall for Mertens, whose powerfully volley crashed into the corner of the net. Mertens almost turned provider shortly afterwards when his cross was headed over the bar by striker Romelu Lukaku, while at the other end Memphis Depay only had Simon Mignolet to beat but fired straight at the Belgium goalkeeper. The Dutch were level after 27 minutes when an incisive breakaway saw Depay provide a low cross for unmarked Groeneveld to score his first Dutch goal in his second international. The visitors had seized the momentum and were unlucky not to take the lead when Quincy Promes struck the post with a shot from the edge of the box, although Hazard should have scored for the hosts soon after when he fired wide from 10 metres. Belgium coach Roberto Martinez withdrew Hazard, Lukaku and Mertens at halftime and one of the replacements, forward Michy Batshuayi, had two chances just after the break but shot wide and had a header saved by goalkeeper Jasper Cillessen. The second period lacked the intensity of the first as both teams tired but Dutch defender Nathan Ake forced an excellent save from Mignolet with a header from a corner, while Pablo Rosario also missed a headed chance for the visitors. 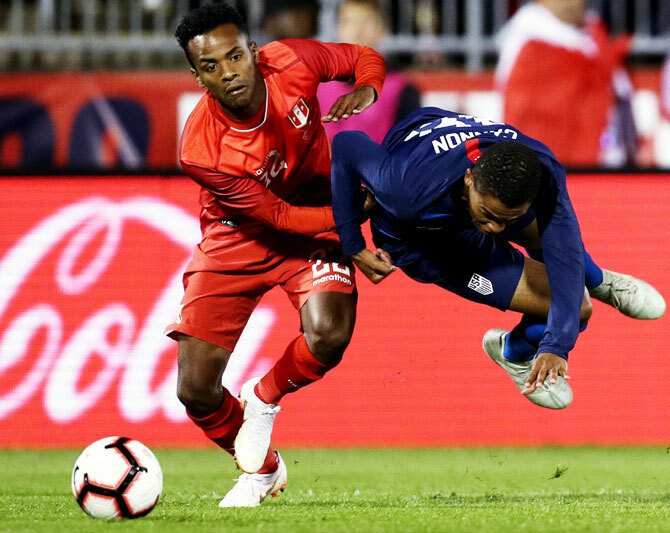 A late goal from Edison Flores cancelled out Joshua Sargent's earlier strike and gave Peru a deserved 1-1 draw with the United States in Connecticut on Tuesday. Peru dominated possession and had more shooting opportunities than the hosts but Sargent's right-footed effort after 49 minutes -- the second goal in two starts for the 18-year-old -- looked like it would earn the Americans the victory. Peru, who beat Chile 3-0 last week, pushed hard for an equaliser and came close when Andy Polo's rasping drive from outside the box ricocheted back off the underside of the bar with goalkeeper Brad Guzman beaten. With five minutes remaining, a line of US defenders failed to clear Polo's tantalizing cross and Flores nipped in at the back post to sidefoot home. The United States, beaten 4-2 by Colombia in their last friendly, take on England and Italy in friendlies next month.